Well, "tens of thousands of dollars", it seems. THE Government is studying ways to reimburse living donors who donate their organs to unrelated recipients, Health Minister Khaw Boon Wan revealed yesterday. The reimbursement amounts have not been determined and details will only be announced early next year, when the Human Organ Trading Act will be amended, he said. But he expected the reimbursement per donor to be in the “tens of thousands of dollars”. In computing the appropriate reimbursement amounts, the Health Ministry will consider many factors, including the donor’s age and the additional medical expenses incurred after donating the organ, Mr Khaw said. Two conditions have to be fulfilled to ensure a proper framework for live organ donations. First, the donor must be fully informed of the consequences and risks of giving away an organ or part of an organ. The other condition is that he or she must be offered suitable reimbursement for life. The National Kidney Foundation may be one non-government organisation that can contribute to the reimbursement amounts, Mr Khaw said. The foundation is studying how it can raise additional funds to support the donors and protect their welfare, he added. Reimbursing living organdonors is a globally acceptable ethical thing to do, Mr Khaw said. This is better than leaving it to the black market where the donors are clearly exploited, he added. Mr Khaw was speaking yesterday to reporters at the re-opening of Woodlands Polyclinic. He had returned recently from Manila where he attended a World Health Organization meeting and visited a village in which people had sold their kidneys for monetary gain. Members of Parliament Today spoke to then were in favour of the idea of third-party compensation for donors, but they said the critical issue was preventing the financial gain from becoming the main reason for organ donation. Madam Halimah Yacob, who chairs the Government Parliamentary Committee for Health, suggested a system wherein organ recipients donate to a fund held by avoluntary welfare organisation or religious body, and the donor draws on that fund for medical treatments or to cover insurance premiums. Looks like it is going to be cheaper than angry doc had predicted. The Straits Times, which angry doc is given to understand is "waging a vociferous campaign against alternative therapies for autism", reported this piece of news off Associate Press yesterday. Curiously, the editor had decided to leave out two paragraphs from the AP report, which angry doc had highlighted in blue. CHICAGO - A US government agency has dropped plans for a study of a controversial treatment for autism that critics had called an unethical experiment on children. The National Institute of Mental Health said in a statement Wednesday that the study of the treatment - called chelation - has been abandoned. The agency decided the money would be better used testing other potential therapies for autism and related disorders, the statement said. The agency wasn't confident enough in the procedure's safety, Dr Nakamura said. The study had been on hold because of safety concerns after another study published last year linked a drug used in the treatment to lasting brain problems in rats. Chelation removes heavy metals from the body and is used to treat lead poisoning. Its use as an autism treatment is based on the fringe theory that mercury in vaccines triggers autism - a theory never proved and rejected by mainstream science. Mercury hasn't been in childhood vaccines since 2001, except for certain flu shots. But many parents of autistic children are believers in the treatment, and NIMH agreed to test it. The researchers had proposed recruiting 120 autistic children ages 4 to 10 and giving half a chelation drug and the other half a dummy pill. The 12-week test would measure before-and-after blood mercury levels and autism symptoms. The study outline said that failing to find a difference between the two groups would counteract 'anecdotal reports and widespread belief' that chelation works. Autism is a spectrum of disorders that hamper a person's ability to communicate and interact with others. 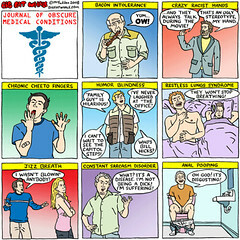 Most doctors believe there is no cure. In cancelling the study, the agency noted it would take another year to review the study and three years to do it. NIMH should reconsider its decision to cancel the chelation study, said Rebecca Estepp, national manager of Talk About Curing Autism, a support group for families with autistic children. "By discontinuing this study, the NIMH will not prove the effectiveness of chelation therapy one way or another. Instead, they have merely left parents with more unanswered questions," Estepp said in a statement. Several scientists praised the decision, including the lead author of the rat study, which found lingering problems in animals that did not have elevated lead levels. 'I think they're making the right decision not to go forward with the study,' said Prof Barbara Strupp, a professor of psychology and nutritional sciences at Cornell University. 'Our data raise concerns about administering (the chelation compound) to children who do not have elevated levels of heavy metals,' Prof Strupp said. Dr Paul Offit, chief of infectious diseases at the Children's Hospital of Philadelphia, agreed with the decision to cancel. 'Suppose that a child suffers a severe side effect from chelation,' said Dr Offit, author of Autism's False Prophets, a new book on autism research. 'Without any evidence it's helpful, I think it's unethical.' The chelation drug proposed for the study, DMSA, can cause side effects including rashes and low white blood cell count. angry doc is unsure whether if the decision is a win or a loss in the "campaign against alternative therapies". On the one hand funding for a study which carries a potential risk towards children but has little biological basis for a cure had been discontinued, but on the other hand such a decision allows proponents of "alternative therapies" to continue to promote their business - since it has not been "disproven" - and even to portray this as a part of a conspiracy by the government and the medical and scientific communities to deny children with autism a chance at a cure. angry doc wonders when our local proponents and practitioners of "alternative therapies" will chime in. angry doc also wonders if, had the study not been discontinued and the result had shown that chelation did not cure autism, proponents of chelation for treatment of autism will accept the evidence and renounce their claims. Past experience does not allow angry doc to be optimistic, so perhaps it is a good thing that the study had been stopped after all. Guess which one angry doc has. If you wanted to conduct a trial to prove that acupuncture works - not just that sticking needles into people relieved certain symptoms, but that traditional acupuncture, with its theories of qi and meridien, actually works, and therefore that the theories may actually be correct - how will you design the trial? 1. Acupuncture works best for pain, a condition which is known to be susceptible to the placebo effect. 2. Physician-patient interaction, physician expectation, and patient expectation all affect the magnitude of the placebo effect. 3. 'Fake' or 'mock' acupuncture in the form of needles which retract and do not penetrate the skin stimulates the brain differently from needles which penetrate the skin. Fake acupuncture produces a placebo effect too, although the magnitude may be less than that of 'true' acupuncture. 4. 'Sham' acupuncture in the form of needles which penetrate the skin at sites other than known acupoints produce the same magnitude of pain relief as 'true' acupuncture. So in order to desgin a trial that will 'prove' that traditional acupuncture works, we should load the design to maximise the placebo effect utilised in traditional acupunture, and avoid mentioning the fact that 'sham' acupuncture will show our 'proof' wrong. In fact, let's leave 'sham' acupuncture out altogether, won't we? For our subject let's pick a condition which main symptom is pain, and let's pick for our measure outcome a self-reported scoring system. To make our trial look legitimate, let's have several arms, including a 'fake' acupuncture arm, but as we mentioned above not a 'sham' acupuncture arm, and let's randomise our patients into these arms. To maximise on the placebo effect provided by physician-patient interaction, let's not blind our physicians to the intervention. If we did all that, we should end up with a trial that shows that traditional acupuncture, with the ritual of individualised diagnosis and actual insertion of needles is superior to no treatment, or ritual but no actual insertion of needles, and we can then try to conclude that acupuncture actually works. Objective.—To check the effectiveness of a true acupuncture treatment according to traditional Chinese medicine (TCM) in migraine without aura, comparing it to a standard mock acupuncture protocol, an accurate mock acupuncture healing ritual, and untreated controls. Background.—Migraine prevalence is high and affects a relevant rate of adults in the productive phase of their life. Acupuncture has been increasingly advocated and used in Western countries for migraine treatment, but the evidence of its effectiveness still remains weak. A large variability of treatments is present in published studies and no acupoint selection according to TCM has been investigated so far; therefore, the low level of evidence of acupuncture effectiveness might partly depend on inappropriate treatment. Design and Methods.—A prospective, randomized, controlled study was performed in 160 patients suffering from migraine without aura, assessed according to the ICD-10 classification. The patients were divided into the following 4 groups: (1) group TA, treated with true acupuncture (according to TCM) plus Rizatriptan; (2) group RMA, treated with ritualized mock acupuncture plus Rizatriptan; (3) group SMA, treated with standard mock acupuncture plus Rizatriptan; (4) group R, without prophylactic treatment with relief therapy only (Rizatriptan). The MIDAS Questionnaire was administered before treatment (T0), at 3 (T1) and 6 months (T2) from the beginning of treatment, and the MIDAS Index (MI) was calculated. Rizatriptan intake was also checked in all groups of patients at T0, T1, and T2. Group TA and RMA were evaluated according to TCM as well; then, the former was submitted to true acupuncture and the latter to mock acupuncture treatment resembling the same as TA. The statistical analysis was conducted with factorial ANOVA and multiple tests with a Bonferroni adjustment. Results.—A total of 127 patients completed the study (33 dropouts): 32 belonged to group TA, 30 to group RMA, 31 to group SMA, and 34 to group R. Before treatment the MI (T0) was moderate to severe with no significant intergroup differences. All groups underwent a decrease of MI at T1 and T2, with a significant group difference at both T1 and T2 compared to T0 (P < .0001). Only TA provided a significant improvement at both T1 and T2 compared to R (P < .0001). RMA underwent a transient improvement of MI at T1. The Rizatriptan intake paralleled the MI in all groups. Conclusions.—TA was the only treatment able to provide a steady outcome improvement in comparison to the use of only Rizatriptan, while RMA showed a transient placebo effect at T1. On first glance one is tempted to conclude as the authors have that traditional acupuncture is "the only treatment able to provide a steady outcome improvement in comparison to the use of only Rizatriptan"; but of course that is true only because the study had not included an arm - a standard 'true' acupuncture arm - that would most likely show that traditional acupuncture is not the "only" effective treatment. angry doc looks at the graph, and his conclusion is that Rizatriptan alone seems to provide a great deal of migraine prophylaxis, while the effects of the various forms of acupuncture are modest, and any variation between them small. 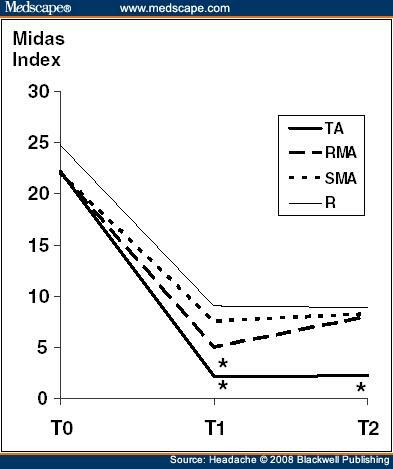 The results also suggest that part of the difference between the acupuncture groups can be attributed to the ritual of acupuncture alone (difference between RMA and SMA), and part of it on the actual effect of insertion of needles versus merely tactile stimulation (difference between RMA and TA). However, without a 'sham' acupuncture group, it is impossible to tell if the superiority of TA is due truly to the site of needle insertion, or just the effect of needles penetrating the skin. But why let that simple fact stop us from saying that traditional acupuncture is the *only* treatment able to provide a steady outcome improvement in migraine comparison to the use of only drugs, right? WE refer to last Thursday's article by The New York Times published by Mind Your Body, "Fact or fiction: Little risk of stroke from neck adjustments". It was indeed fiction. The author used a "survey of only 55 cases" from neurologists. Fortunately, recent scientific studies, in 2007, like The Neck Pain Task Force, came up with more definite facts on the matter. The study - which analysed a total of 818 Vertebral Artery (VBA) strokes over the nine-year inception period in Ontario - concluded that VBA stroke is a very rare event and that the risk of VBA stroke associated with a visit to a chiropractor's office appears to be no different from the risk of VBA stroke following a visit to a medical clinic. "Our research has led us to believe that the association between VBA stroke and chiropractic care is likely due to patients with headache and/or neck pain from a VBA dissection seeking care in the prodrome of a stroke," explained the study's lead author, Dr David Cassidy, professor of epidemiology at the University of Toronto and senior scientist at the University Health Network at Toronto Western Hospital. In other words, the patients were already having the problem prior to visiting a physician. "We found no evidence of excess risk of VBA stroke associated with chiropractic care beyond that associated with primary physician care," said Dr Cassidy. He added that these rare strokes have also been reported after ordinary neck movements such as looking up at the sky, turning the head while backing up a car and extending the neck into a hair salon's wash basin. Other researches have also shown that when certain studies were scrutinised, the practitioners performing the manipulation were actually not chiropractors. Chiropractors are trained professionals with an evidence-based tertiary education; and belong to the only profession that specialises in spinal manipulation. We are trained to do a thorough history and physical assessment to screen patients who might be at risk for the rare incidence of VBA stroke. As an association, we ensure that all our members meet the international standards of education and are in good standing in their countries of origin and adhere to our code of ethics and practice guidelines. So is a visit to the chiropractor's office really as safe as a visit to a medical clinic? "... if you are less than 45 and visit a chiropractor, there is a strong association between that visit and a stroke in the next 24 hours." "Young people should not have any stroke. In the young, vertebral artery dissection is a common cause of a rare event. It is also the worry from chiropractic neck manipulation. If you could find an effect of chiropractic, it would be in the young. And they do. The people who have an increase in stroke are those under age 45. And it is a big association: odds ratios from 3 to 12. Note the word association. Association is not causation. You would need a prospective study comparing stoke rates from chiropractic patients vs non chiropractic patients to find causality." "My conclusion, from reading the paper in its entirety, rather than the abstract, is that a population that should not have a stroke, the young, has a marked increase association with stroke 24 hours after visiting a chiropractor and that given the rarity of a vertebral artery dissection as a cause of stroke in the elderly, the elderly is not a group that one could easily find an increase in stroke after chiropractor visit. However, given that chiropractic neck manipulation is worthless magical thinking, ANY stroke is one too many." Other aspects of the paper are also reviewed in the article, so it is well worth a read. What angry doc is curious about is whether those patients who were admitted for VBA strokes after a visit to the chiropractor had any neck manipulation done at all, because if chiropractors are trained to be able to detect strokes, and their interperetation of the study is that patients who visited a chiropractor and were subsequently found to have a VBA stroke may in fact have been presenting with the prodrome of the stroke, then surely they should *not* have undergone neck manipulation. Or is neck manipulation a cure for VBA stroke?